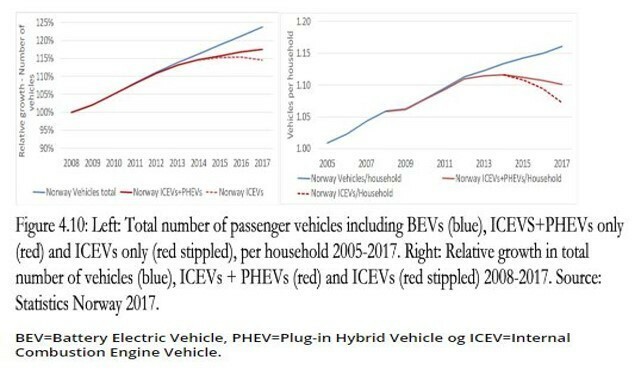 By June 2018, 47% of all new cars sold in Norway were either hybrid or battery powered electric vehicles. Electric vehicles make up only a small percentage of the global fleet of cars, but perhaps not for much longer. In some countries sales of EVs are soaring and overtaking sales of traditional cars. It’s no longer hard to imagine that the next generation will view the internal combustion engine in much the same way as we view the horse and cart - a relic of times past. The Nordic countries are racing ahead when it comes to electric transformation. For instance, of all the cars sold in Norway this year, almost half were electric. By June 2018, 47% of all new cars sold were either plug-in hybrid or battery powered electric vehicles. 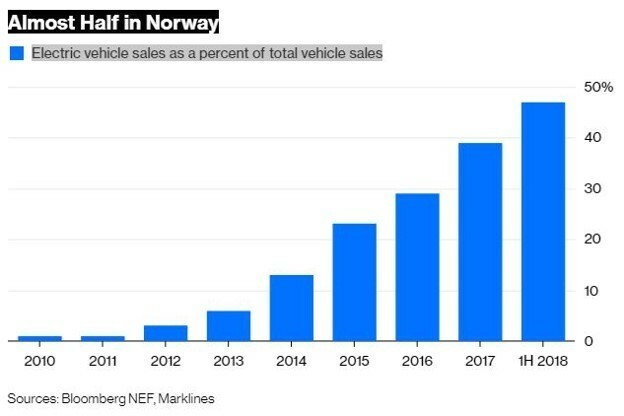 According to the Norwegian Institute of Transport Economics, sales of electric vehicles in fact reached a tipping point in 2014. That year, total vehicle ownership increased, but sales of combustion engine vehicles declined. Electric vehicle sales made up the balance. Since the 1990s, Norway has had a very generous incentive system to encourage the proliferation of electric cars. Drivers benefit from free parking and free charging in public places and no annual road tax. Road toll charges are waived and electric cars are allowed to use bus lanes. 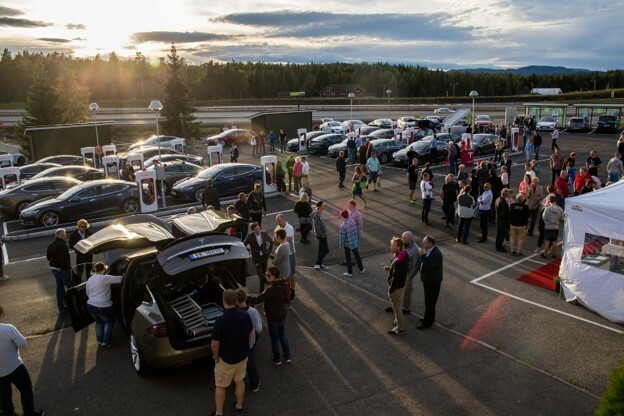 Norway also has the world’s largest fast-charging station, capable of charging up to 28 vehicles at a time in around half an hour. Oslo is known as the EV capital of the world because of its high proportion of electric vehicles. The city aims to be fossil-free by 2024. It already bans diesel cars on certain days, and wants to have zero diesels on the road by 2025. However, Norway’s transition to electric vehicles is not without its challenges. Drivers sometimes struggle to find an available charging point in central Oslo. That’s because the number of charging points per vehicle has dropped from one charger per four cars, to one charger per 10 cars. In order to reach its goal of zero emission vehicles by 2025, the Institute of Transport Economics says that electric cars must replace all vehicles in multi-vehicle households. Currently, multi-vehicle households have only one. As the number of vehicles increases, drivers may face longer stops and charging queues on long distance routes. Indeed, a recent World Economic Forum Report found that, without proper planning, electric vehicles could bring about problems. The report points out that, when the city granted access to priority lanes for any EV, the lane quickly became congested. It has since amended the rule to include only shared EVs. The report also warns that city planning for electric vehicle infrastructure is based largely on current patterns of mobility and vehicle ownership. This doesn’t necessarily take into account how the electricity system and grid technologies will work. “As a consequence, EV charging could create local constraints and stability problems on power networks and reduce the environmental benefits of electrification,” says the report. In fact, in order to have any hope of achieving our zero emission goals, public and commercial transport also needs to go electric. In addition, in highly populated cities, while the use of electric vehicles will reduce air pollution, it won’t necessarily alleviate congestion. In this case, suggests the report, cities should focus on decreasing the use of personal cars in favour of shared vehicles. The increase in Norway’s electric fleet follows a global trend in electric vehicle sales. Bloomberg New Energy Finance estimates that the global electric vehicle market has already passed 4 million. 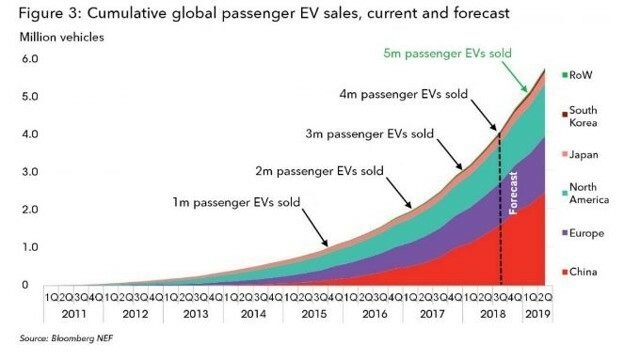 Though electric vehicles account for a small number in absolute terms (the equivalent sales of traditional cars is around 590 million), their growth is phenomenal. Sales in electric vehicles represents 2.5% of the total cars sold, but 50% of car sales growth. Bloomberg also notes that it took nearly five years to get to the first million, but only six months to get from 3 million to 4 million. China continues to be the largest player in the global EV market. It is responsible for 37% of passenger EVs sold around the world since 2011.